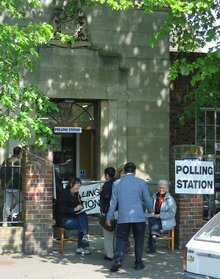 The 2005 United Kingdom general election was held on Thursday 5 May 2005, to elect 646 members to the House of Commons. The Labour Party led by Tony Blair won its third consecutive victory, with Blair becoming the only Labour leader beside Harold Wilson to form three majority governments. However, its majority now stood at 66 seats compared to the 160-seat majority it had previously held. As of 2019, it remains the last general election victory for the Labour Party. The Labour campaign emphasised a strong economy; however, Blair had suffered a decline in popularity, which was exacerbated by the decision to send British troops to invade Iraq in 2003. Despite this, Labour mostly retained its leads over the Conservatives in opinion polls on economic competence and leadership, and Conservative leaders Iain Duncan Smith (2001-3) and Michael Howard (2003-5) struggled to capitalise on Blair's unpopularity, with the party consistently trailing Labour in the polls throughout the 2001-5 Parliament. The Conservatives campaigned on policies, such as immigration limits, improving poorly-managed hospitals and reducing high crime rates, all under the slogan "Are you thinking what we're thinking?". The Liberal Democrats, led by Charles Kennedy, were opposed to the Iraq War, given that there had been no second UN resolution, and collected votes from disenchanted Labour voters. Tony Blair was returned as Prime Minister, with Labour having 355 MPs, but with a popular vote of 35.2%; the lowest of any majority government in UK electoral history. In terms of votes, it was only narrowly ahead of the Conservatives, but still had a comfortable lead in terms of seats. The Conservatives returned 198 MPs, with 32 more seats than they had won at the previous general election, and won the popular vote in England, while still ending up with 91 fewer MPs in England than Labour; this indicated the party lost many close races and won more large majorities in its heartlands. The Liberal Democrats saw their popular vote increase by 3.7% and won the most seats of any third party since 1923, with 62 MPs. Anti-war activist and former Labour MP George Galloway was elected as the MP for Bethnal Green and Bow under the Respect – The Unity Coalition banner; Richard Taylor was re-elected for Kidderminster Health Concern in Worcestershire; and independent candidate Peter Law was elected in Blaenau Gwent. In Northern Ireland, the Ulster Unionist Party, the more moderate of the main unionist parties, which had dominated Northern Irish politics since the 1920s, was reduced from six MPs to one, with party leader David Trimble himself being unseated. The more hardline Democratic Unionist Party became the largest Northern Irish party, with nine MPs elected. Following the election, Conservative leader Michael Howard resigned and was succeeded by future Prime Minister David Cameron. Blair resigned as both Prime Minister and Leader of the Labour Party in June 2007, and was replaced by then-Chancellor of the Exchequer Gordon Brown. The election results were broadcast live on the BBC, and presented by Peter Snow, David Dimbleby, Jeremy Paxman and Andrew Marr. For events leading up to the date of the election, see pre–election day events of the United Kingdom general election, 2005. The governing Labour Party, led by Tony Blair, was looking to secure a third consecutive term in office and to retain a large majority. The Conservative Party was seeking to regain seats lost to both Labour and the Liberal Democrats since the 1992 general election, and move from being the Official Opposition into government. The Liberal Democrats hoped to make gains from both main parties, but especially the Conservative Party, with a "decapitation" strategy targeting members of the Shadow Cabinet. The Lib Dems had also wished to become the governing party, or to make enough gains to become the Official Opposition; but more realistically hoped to play a major part in a parliament led by a minority Labour or Conservative government. In Northern Ireland the Democratic Unionist Party sought to make further gains from the Ulster Unionist Party in unionist politics, and Sinn Féin hoped to overtake the Social Democratic and Labour Party in nationalist politics. (Note that Sinn Féin MPs do not take their seats in the House of Commons—they refuse to swear an oath of allegiance to the Queen as required). The pro-independence Scottish National Party and Plaid Cymru (Party of Wales) stood candidates in every constituency in Scotland and Wales respectively. Many seats were contested by other parties, including several parties without incumbents in the House of Commons. Parties that were not represented at Westminster, but had seats in the devolved assemblies and/or the European Parliament, included the Alliance Party of Northern Ireland, the UK Independence Party, the Green Party of England and Wales, the Scottish Green Party, and the Scottish Socialist Party. The Health Concern party also stood again. A full list of parties which declared their intention to run can be found on the list of parties contesting the 2005 general election. All parties campaigned using such tools as party manifestos, party political broadcasts and touring the country in what are commonly referred to as battle buses. Local elections in parts of England and in Northern Ireland were held on the same day. The polls were open for fifteen hours, from 07:00 to 22:00 BST (UTC+1). The election came just over three weeks after the dissolution of Parliament on 11 April by Queen Elizabeth II, at the request of the Prime Minister, Tony Blair. Following the death of Pope John Paul II on 2 April, it was announced that the calling of the election would be delayed until 5 April. Thanks to eight years of sustained economic growth Labour could point to a strong economy, with greater investment in public services such as education and health. This was overshadowed, however, by the issue of the controversial 2003 invasion of Iraq, which met widespread public criticism at the time, and would dog Blair throughout the campaign. The Chancellor, Gordon Brown, played a prominent role in the election campaign, frequently appearing with Tony Blair and ensuring that the economy would remain the central focus of Labour's message. For the Conservatives, their recently elected leader Michael Howard brought a great level of experience and stability to a party that had ousted its former leader Iain Duncan Smith just 18 months prior. The Conservatives focused their campaign on more traditional conservative issues like immigration, which created some controversy with the slogan "It's not racist to impose limits on immigration". They also criticised Labour's "dirty" hospitals and high crime levels, under the umbrella of the slogan "Are you thinking what we're thinking?". However, Labour counter-attacked, by emphasising Howard's role in the unpopular Major Government of 1992–1997, airing a party election broadcast attacking Howard, showing a montage of scenes from Howard's tenure as Home Secretary, including prison riots and home repossessions. It also launched a billboard campaign showing Howard, and the Conservative Party's four previous leaders: Iain Duncan Smith, William Hague, John Major and Margaret Thatcher, with the caption "Britain's working, don't let the Tories wreck it again". For the Liberal Democrats, this was the second, and final election campaign fought by leader Charles Kennedy, who was strongly opposed to the Iraq War, and offered a more down to earth approach to voters, which proved popular. There were some questions, however, over Kennedy's abilities when, at the Liberal Democrat manifesto launch, he was asked about local income tax, but appeared confused on the figures. Both the Liberal Democrats and the Conservatives were keen to tackle Labour's introduction of tuition fees, which was opposed by both parties, and they promised to abolish these fees. At the close of voting (2200 BST) the ballot boxes were sealed and returned to the counting centres, where counting proceeded under the supervision of the returning officer who was obliged to declare the result as soon as it was known. As previously, there was serious competition amongst constituencies to be first to declare. Sunderland South repeated its performance in the last three elections and declared Labour incumbent Chris Mullin re-elected as MP with a majority of 11,059 at approximately 2245 BST (failing by two minutes to beat its previous best, but making it eligible for entry into the Guinness Book of World Records as longest consecutive delivery of first results). The vote itself represented a swing (in a safe Labour seat, in a safe Labour region) of about 4% to the Conservatives and 4.5% to the Liberal Democrats, somewhat below the prediction of BBC/ITV exit polls published shortly after 2200 BST. Sunderland North was the next to declare, followed by Houghton and Washington East, both Labour holds but with reductions in the incumbent majorities of up to 9%. The first Scottish seat to declare was Rutherglen and Hamilton West — another safe Labour seat, also a Labour hold, but with the majority reduced by 4%. The first seat to change hands was Putney, where Labour's majority of around 2,500 fell to a strong Conservative challenge, with a total swing of about 5,000 (6.2%). This was also the first seat to be declared for the Conservatives. The first Liberal Democrat seat to be declared was North East Fife, the constituency of LibDem deputy leader Sir Menzies Campbell which he had held since 1987. The constituency of Crawley in West Sussex had the slimmest majority of any seat, with Labour holding off the Conservatives by 37 votes after three recounts. Following problems with exit polls in previous British elections, the BBC and ITV agreed for the first time to pool their respective data, using results from Mori and NOP. More than 20,000 people were interviewed for the poll at 120 polling stations across the country. The predictions were very accurate—initial projections saw Labour returned to power with a majority of 66 (down from 160), and the final result (including Staffordshire South, where the election was postponed due to the death of a candidate) was indeed a Labour majority of 66. The projected shares of the vote in Great Britain were Labour 35% (down 6% on 2001), Conservatives 33% (up 1%), Liberal Democrats 22% (up 4%) and other parties 8% (up 1%). The Conservatives were expected to make the biggest gains, however — 44 seats according to the exit poll — with the Liberal Democrats expected to take as few as two. Whilst the Lib Dems' vote share predicted by the exit poll was accurate (22.6% compared to the actual 22.0%) they did better in some Lib Dem-Labour marginals than predicted on the basis of the national share of the vote, and achieved a net gain of 11 seats. There were major boundary changes in Scotland, where the number of seats were reduced from 72 to 59. As a result of this a number of seats were lost by each party, and this notional election result below is based on the 2001 election results if they had been fought on these new 2005 boundaries. 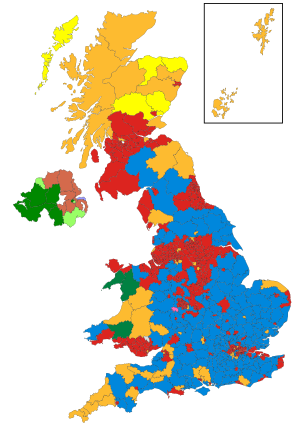 For results by county/region and analysis, see Results breakdown of the United Kingdom general election, 2005. For results by constituency, see Constituency results of the United Kingdom general election, 2005. For details by MP, see MPs elected in the UK general election, 2005. Votes cast by age group: Con, Lab, LD, other parties (green) and those not voting (grey). At 04:28 BST, it was announced that Labour had won Corby, giving them 324 seats in the House of Commons out of those then declared and an overall majority, Labour's total reaching 355 seats out of the 646 House of Commons seats. Labour received 35.3% of the popular vote, equating to approximately 22% of the electorate on a 61.3% turnout, up from 59.4% turnout in 2001. Increased turnout was mostly attributed to the extension and promotion of the postal voting system, which has been criticised as being too insecure increasing the risk of electoral fraud. As expected, voter disenchantment led to an increase of support for many opposition parties, and caused many eligible to vote, not to turn out. Labour achieved a third successive term in office for the first time in their history, though with reduction of the Labour majority from 167 to 67 (as it was before the declaration of South Staffordshire). As it became clear that Labour had won an overall majority, Michael Howard, the leader of the Conservative party, announced his intention to retire from front-line politics. The final seat to declare was the delayed poll in South Staffordshire, at just after 1 a.m. on Friday 24 June. The election was followed by further criticism of the UK electoral system. Calls for reform came particularly from Lib Dem supporters, citing that they received only just over 10% of the overall seats with 22.1% of the popular vote. The only parties to win a higher percentage of seats than they achieved in votes were Labour, the Democratic Unionist Party and Sinn Féin, and Health Concern, which ran only one candidate. The results of the election give a Gallagher index of dis-proportionality of 16.76. The Labour Government claimed that being returned to office for a third term for the first time ever showed the public approval of Labour's governance and the continued unpopularity of the Conservatives. Nevertheless, Labour's vote declined to 35.3%, the lowest share of the popular vote to have formed a majority government in the history of the UK House of Commons. In many areas the collapse in the Labour vote resulted in a host of seats changing hands. Labour also failed to gain any new seats, almost unique in any election since 1945. As well as losing seats to the Tories and the Liberal Democrats, Labour also lost their safest seat in Wales to Independent Peter Law, and Bethnal Green and Bow to Respect candidate George Galloway. The Conservatives claimed that their increased number of seats showed disenchantment with the Labour government and was a precursor of a Conservative breakthrough at the next election. Following three consecutive elections of declining representation and then in 2001 a net gain of just one seat, 2005 was the first general election since 1983 where the number of Conservative seats increased appreciably, although the Conservatives' vote share increased only slightly and this election did mark the third successive general election in which the Conservatives polled below 35%. In some areas the Conservative vote actually fell. The Conservatives claimed to have won the General Election in England, since they received more votes than Labour although Labour still won a majority of seats. The Liberal Democrats claimed that their continued gradual increase in seats and percentage vote showed they were in a position to make further gains from both parties. They pointed in particular to the fact that they were now in second place in roughly one hundred and ninety constituencies and that having had net losses to Labour in the 1992 general election and having not taken a single seat off Labour in 1997, they had held their gains off Labour from the 2001 general election and had actually made further gains from them. The Liberals also managed to take 3 seats from the Conservatives, notably Tim Collins, through the use of a decapitation strategy, which targeted senior Tories. The Liberal Democrats increased their percentage of the vote by 3.7%, the Conservatives by 0.6%, and Labour's dropped by 5.4%. The results were interpreted by the UK media as an indicator of a breakdown in trust in the government, and in Prime Minister Tony Blair in particular. Meanwhile, the SNP had a good night in Scotland, regaining the Western Isles and Dundee East from Labour, having lost both seats in 1987. In Wales Plaid Cymru failed to gain any seats, and lost Ceredigion to the Liberal Democrats. In Northern Ireland the Ulster Unionists were all but wiped out, only holding onto North Down, with leader David Trimble losing his seat in Upper Bann. For the first time the DUP became the biggest party in Northern Ireland. It was the first general election since 1929 in which no party received more than ten million votes. It was the most "three-cornered" election since 1923, though the Liberal Democrats failed to match the higher national votes of the SDP-Liberal Alliance in the 1980s either in absolute or percentage terms. The total combined vote for Labour, the Conservatives and the Liberal Democrats proved to be the lowest main three party vote since 1922. The figure of 355 seats for Labour does not include the speaker Michael Martin. See also the list of parties standing in Northern Ireland. The disproportionality of the house of parliament in the 2005 election was 16.89 according to the Gallagher Index, mainly between Labour and The Liberal Democrats. Following the election result, Labour remained in power and Tony Blair remained Prime Minister, reshuffling Cabinet and junior ministers over the following weekend, with formal announcements made on 9 May 2005. The most senior positions of Chancellor, Home Secretary and Foreign Secretary remained the same, but a few new faces were added; most notably David Blunkett returned to cabinet as the Work and Pensions Secretary, although he was forced to resign again due to another scandal before the end of the year that spawned a national press and opposition campaign for his dismissal. Patricia Hewitt became the new Health Secretary, Tessa Jowell remained as Culture Secretary, whilst Alan Johnson was promoted to Trade and Industry Secretary. Meanwhile, Ruth Kelly retained the Education job and Margaret Beckett stayed put at Environment. The new Parliament met on 11 May for the election of the Speaker of the House of Commons. On 6 May, Michael Howard announced he would be standing down as leader of the Conservative Party, but not before a review of the leadership rules. The formal leadership election began in October, and was ultimately won by David Cameron. On 7 May, David Trimble resigned as leader of the Ulster Unionist Party; Sir Reg Empey was elected as his successor at an Ulster Unionist Council meeting on 24 June. The prime minister Gordon Brown visited Buckingham Palace on 6 April 2010 and asked the Queen to dissolve Parliament on 12 April. The next election was held on 6 May 2010. ^ "Blair is not the only one with Iraq amnesia – the Lib Dems were NOT anti-invasion, just anti-that-kind-of-invasion". UK: Left Foot Forward. 17 June 2014. Retrieved 26 March 2015. ^ 3 Apr 2005 (3 April 2005). "Blair delays election call". London: Telegraph. Retrieved 9 March 2011. ^ "Tory leader ousted". BBC News. 29 October 2003. ^ "Tory election poster sparks complaints of racism from students and teachers". The Independent. London. 7 February 2005. ^ "Kennedy admits battling alcohol". BBC News. 5 January 2006. ^ "2005: Historic third term for Labour". BBC News. 20 September 2007. ^ a b Plunkett, John (6 May 2005). "Broadcasters hail success of joint poll". London: MediaGuardian. Retrieved 21 July 2009. ^ McSmith, Andy (4 July 2006). "The Big Question: What is the West Lothian question, and can it be resolved satisfactorily?". The Independent. London. ^ Carlin, Brendan; Sapsted, David (4 May 2005). "Defiant Kennedy takes 'decapitation' strategy into Tory heartland". The Daily Telegraph. London. ^ "SNP secures Western Isles victory". BBC News. 6 May 2005. ^ "2005 UK General election results, manifestos, PMs biography". UK Political Info. 13 April 2005. Retrieved 9 March 2011.